Just down the road from Melbourne is one of Australia’s best-kept wine and food secrets, the Bellarine Peninsula. Travel editor Winsor Dobbin goes exploring. Vineyards, boutique distilleries and breweries, fine dining and great beaches. The Bellarine Peninsula has the lot – and it is just a 60-minute drive or bracing ferry ride from Melbourne. The Bellarine is surrounded by Port Phillip, Corio Bay and Bass Strait. It’s home to around 55,000 people and is a growing tourism region. Most of the peninsula is part of the City of Greater Geelong. Australian TV series SeaChange was filmed at various locations on the peninsula, particularly at Barwon Heads and the region is a popular weekend destination for Melburnians, many of whom catch the ferry to the picturesque small town of Portarlington, where you can still buy mussels from the fishermen on the wharf. With uninterrupted bay views across to the You Yangs, Portarlington is a great base for those looking to escape city hustle and bustle – and there are plenty of dining options. We stayed in Bungalino, a cosy Airbnb property that is perfect for couples and just a short drive from the beach. It costs just $130 per night and has access to a lovely deck and garden. It is easy to spend a few days lazing around in Portarlington, which has several cafes and eateries and a classic old country hotel. The new Bellarine Taste Trail is helping reinforce the Bellarine region’s reputation as a top destination for foodies and wine-lovers, providing more than 60 destinations at which to discover its epicurean delights. The trail brings together a treasure trove of products, ranging from wines and boutique beers, farm gate produce, B&B’s, cafes and restaurants. To download the Bellarine Taste Trail map: www.thebellarinetastetrail.com.au. The booming seaside towns of Ocean Grove, Barwon Heads and Point Lonsdale are all popular in summer. Wineries well set up for visitors include Terindah Estate, Jack Rabbit and Oakdene, all of which have two dining options as well as offering tastings, Leura Park, Scotchmans Hill, Bellarine Estate and Brewery (home to French restaurant Bouchon), and Curlewis Wines. Several others request appointments for visits. The Bellarine is also home to one of Australia’s great walks: the Bellarine Rail Trail. Originally opened in 1879 to assist in the defence of Port Phillip Bay from a feared Russian invasion, the railway proved more useful carrying visitors to the popular resort town of Queenscliff until the line’s closure almost 100 years later. Today it’s a great way for cyclists and walkers to discover the region. Starting at the showgrounds on the outskirts of Geelong, the gentle climb towards the half-way point of Drysdale is rewarded with fine views back over Geelong and north to Corio Bay and the You Yangs. From the restored Drysdale railway station, the trail runs alongside the historic Bellarine Peninsula Railway, with vintage trains operating regularly. It’s an easy ride through areas rich in wildflowers and native bird life to Queenscliff. Here visitors can explore, take a boat trip into Port Phillip Bay or the ferry across to Portsea or Sorrento on the Mornington Peninsula, another leading gourmet region. # Take a stroll out along the Portarlington pier and seawall and take in the spectacular bay views. Buy some fresh mussels from the local shipping fleet if the boats are in port. # Head to one of the many local wineries for a vineyard lunch. The Shed at Terindah Estate features excellent food, local wines and top-notch service with sweeping views from the terrace. # Take one of the ferries that run daily between Portarlington and the Docklands precinct in Melbourne. A memorable day trip. # Head for the township of St Leonards, pick up some delicious freshly-cooked fish and chips from The Golden Flake and enjoy them while overlooking the bay. # Take a night trip into the “big smoke” of Victoria’s second-largest city Geelong for a pre-dinner drink at the Geelong Cellar Door wine bar and some inventive food at Igni restaurant. 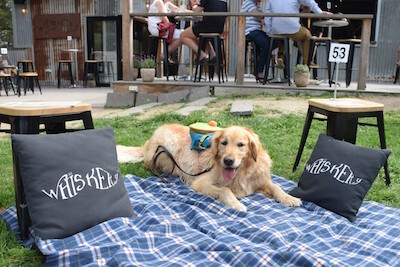 # Enjoy a picnic or pizza along with an al fresco gin tasting at The Whiskery, a new distillery complex just down the road from Scotchmans Hill. 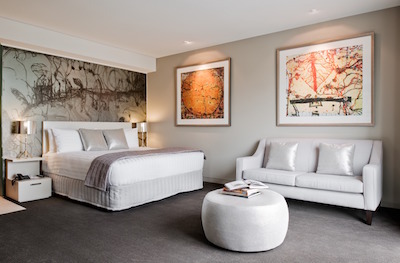 If you plan a night or two in Melbourne en route to the Bellarine, the Olsen and The Blackman, two members of Art Series Hotels, are hosting a special art experience for guests. 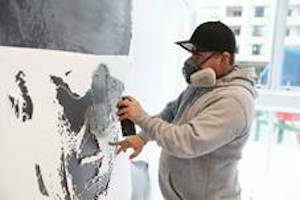 Through to December 30, a white-washed room at both hotels has been transformed into a collective canvas as part of a participatory art project. Colour Your Stay will rely on guests to help create an ever-changing mural and become part of the shared experience. A pioneer of the Australian street art and stencil movement, Luke Cornish (aka ELK) is leading the project for Art Series. In a nod to each of the hotels’ namesake artists. He has created portraits of John Olsen and Charles Blackman that guests are called on to complete. A mixture of spray cans and paint brushes, a gown, mask and gloves will be available for guests to use in the room. I recently stayed in The Olsen, superbly situated on Chapel Street in chic South Yarra. Temptations abound with top restaurants including France Soir, Da Noi and Dainty Sichuan within strolling distance, although the hotel’s own Spoonbill serves some enticing modern Australian cuisine and a particularly good breakfast. I was impressed by the modern and contemporary décor and super-comfortable beds. It had the welcoming feel of a much smaller boutique hotel. The 224 Olsen rooms all feature kitchenettes and prints from painter John Olsen. The Olsen also has a large glass-bottom swimming pool, day spa and a contemporary restaurant and bar. And, of course, it is in the heart of Melbourne’s best shopping district. To find out more visit www.artserieshotels.com.au/colouryourstay/ or call 1800 278 468. Colour Your Stay packages start from $189 per night.